In 2006 the EU began considering plans to overhaul the Europe-wide animal experimentation rules under EC Directive 86/609. NAVS and ADI embarked on a relentless campaign on behalf of millions of laboratory animals. The campaign began with a promising start as an unprecedented number of MEPs, over half of those in the Parliament, signed our Written Declaration 40 on phasing out experiments on Non Human Primates. 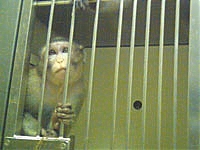 Ending animal tests for higher education, household products, forensic enquiries and preservation of species. Putting replacement of animals in the heart of the Directive and establishing a centre to co-ordinate the development of alternatives. ADI published a raft of campaign materials including: a triple investigation into the primate trade - experiments, trapping, suppliers - DVD and reports in 6 languages; a dozen scientific and legal technical briefings – some in as many as 12 languages; eye-catching door hangers, key rings and primate themed mints for MEPs. We also provided analysis and comment of each and every amendment before MEPs voted on them. Due to being spooked by the blackmail from industry, MEPs voted for proposals which fell far short of what has been in place in the UK and several other Member States for years. Although we had hoped for more, we prevented what could have been a complete meltdown of the regulation of the science industry and protection of animals across the European Union. At the next stage of discussions by the Council of Ministers, ADI faced the toughest and least transparent stage of the process. We continued meetings with Council advisors, created awareness and involved the public, with Save the Primate campaign launches in Spain, Italy and Belgium and postcard campaigns in the UK. We also submitted a letter of key demands, signed by over 10,000 people from across Europe, to the Council and produced key information briefings. The new Directive was finalised in September 2010 and marked the beginning of a new campaign on the implementation of the law into the UK. ADI are continuing to campaign hard, through the NAVS, for the UK Government to realise the opportunity to seriously commit to the implementation of sophisticated replacements for animal experiments; advancing science whilst ending animal suffering.